In this solo cooking adventure, Kate attempts to find redemption for Mark Bittman though he doesn’t know he needed any. 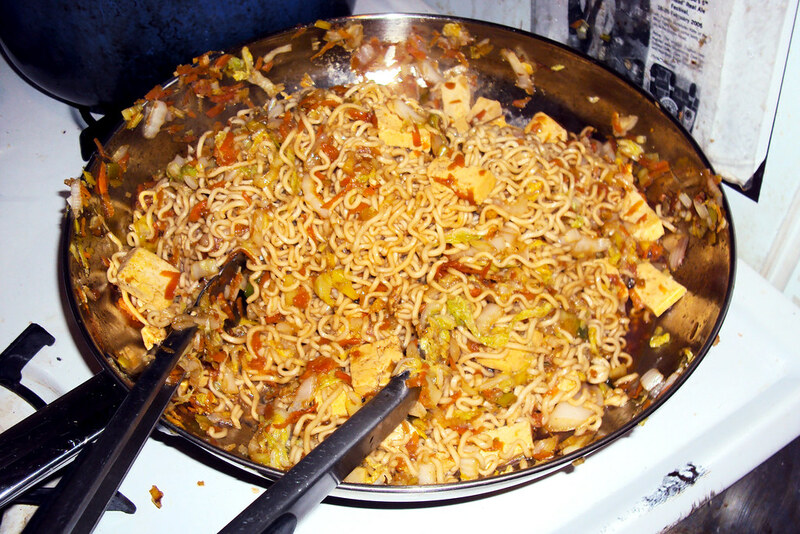 Bittman’s yakisoba, sitting in a skillet, ready to be served. I was mad at Mark. I know. It wasn’t his fault that I ruined the main component of his ginger fried rice (the rice) and therefore was unimpressed with the final result. Or that I forgot the “if it sounds too good to be true–it probably is” rule, and attempted a dessert with no fat and expected it to somehow taste magnificent. Still, Foodie Call #5 Cooking In: “Bittman Bonanza” had been a disaster and I was… if not mad precisely, then disappointed. The bloom was off the rose. It’s like the first fight with your beloved. You probably still love them afterwards. You maybe are even closer. You have likely learned some valuable lessons about yourself and/or the nature of relationships. But the ecstasy, the idea that this person is somehow the one to save you, to lift you from the drudgery of everyday life and transport you up to some permanent bliss-like state in the fluffy white clouds, is gone. You still love them, but with the end of the initial infatuation stage comes a sobering tumble back down to earth and reality sets in with a thud. They’re human. Mark Bittman is the man. But he is only (hu)man, and he can occasionally persuade me to make something disappointing, as Gary and I learned the hard way last week. Which is why I wasn’t so sure about his yakisoba recipe that I had commited to making before Mark’s fall from grace. It was the topic of his Minimalist column a few weeks ago and I immediately bookmarked it. Although I have never actually had yakisoba, what Mark made looked delicious. While being his usual charming self in his online video demo (I love watching those things and then making what he makes), he explained that the yakisoba is: “Japanese fast food that came from China. Sorta.” Although there are a million ways to make it, Mark explained, they all have pretty much the same four things: noodles (although not actually soba noodles), vegetables, protein (I envisioned yummy tofu instead of the pork that he used), and a sauce that he basically admitted was a bit ghetto (he even said he expected a barrage of emails telling him how wrong his particular sauce was) all put together in virtually no time. The controversy, the novelty aspect, the ease and speed called my name. I answered. To ensure that I would actually make it, I invited over a friend for dinner and promised Yakisoba noodles. This was planned before the Foodie Call #5 fiasco and Mark’s fall from grace, but was to take place after. But I couldn’t go back on my word. My friend Jill is a delight to cook anything for, she was a vegetarian before I, has a love of all things carb and vegetable, and we’ve worked in the service industry equally long. All that equals an appreciation for food, vegetables, tofu, and wine, and I had promised her Yakisoba. So that’s what she got. I prepped all the ingredients before she arrived, which took all of about 15 minutes. She came in hungry from a hard day of waiting on tables so I poured her a glass of wine and got to work. I increased the ginger called for because I love ginger and I wanted to use what I had before it went bad. That worked, really infusing the sauce with fresh ginger aroma and bite. 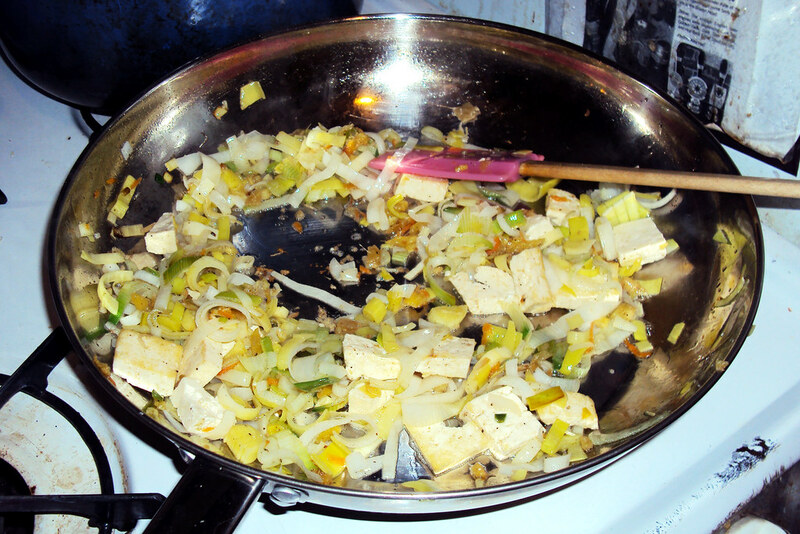 I had leftover leeks from dinner Saturday and included those as I cooked the ginger and tofu. I won’t be doing that again as they added a sweetness that the dish just does not need. Browning the tofu in the ginger and oil with leftover leeks. I used tofu instead of pork and added it in two stages. The first half I seared on high heat in the oil and the ginger, getting some nice flavor and color on the pieces as Mark had done with his pork. But there wasn’t enough room in my large skillet to use all the tofu and I used that to my advantage. The rest I threw in with the noodles and the sauce, figuring that it would absorb the flavor of the sauce and give an added softer textural element. Everything in the skillet browning and cooking down at an insane pace. It came together ridiculously fast. A good thing when you’re having a dinner guest and you’d rather talk with them than slave away at the stove. Mark, I’m happy to say, is back in my good graces. It was delicious! The crunch of the cabbage with the softness of the noodles were a hit. The tofu was indeed seasoned well with the yakisoba sauce, and the seared portion added at the start had a denser, meatier quality which we enjoyed. Next time I would use even more cabbage and carrots as they both cook down considerably, and add whatever other vegetables I have on hand (mushrooms would be good for an earthy element, finely cut zucchini would also work) for this truly delicious, and easy, signature Mark Bittman, minimalist dinner. 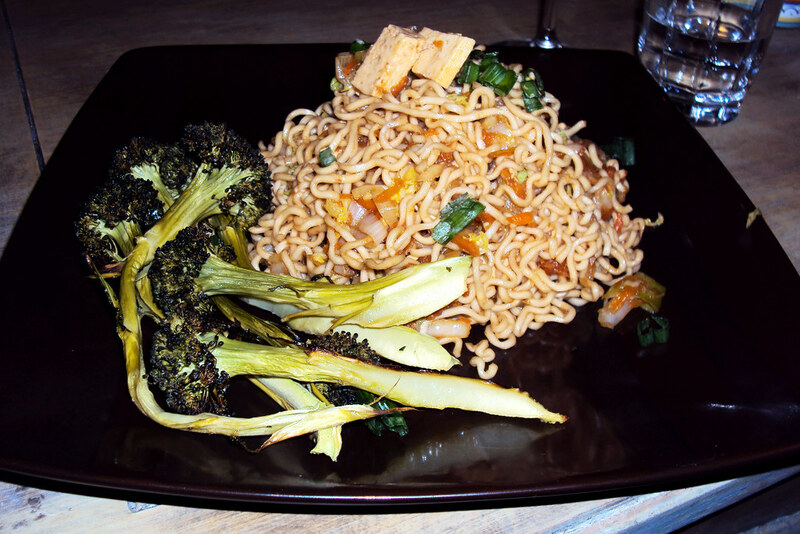 Bittman’s yakisoba with a side of roasted broccoli. My relationship with Mark has indeed been deepened and enriched. I no longer will make anything he makes blindly and expect it to be amazing. I will realize that there will be mostly hits and occasionally a miss but this doesn’t mean that I will give up on him. No. I can love him while at the same time being true to myself and trusting my instincts. It isn’t some fantasy relationship, but it’s a pretty solid one. I’ll take it. Remove the tofu from its packaging and wrap in an absorbent towel. Place a heavy cookbook or pot on top to drain it of excess liquid. After several minutes, remove from towel and cut into 3/4 inch cubes or slices. Put peanut oil in a large skillet over medium-high heat. When it’s hot, add ginger and cook, stirring, until just fragrant, about 1 minute. Add half of the tofu and cook for a few minutes until the tofu is starting to brown around the edges. Meanwhile, stir together in a small bowl ketchup, soy sauce, Worcestershire sauce, mirin (or sugar), and Sriracha. 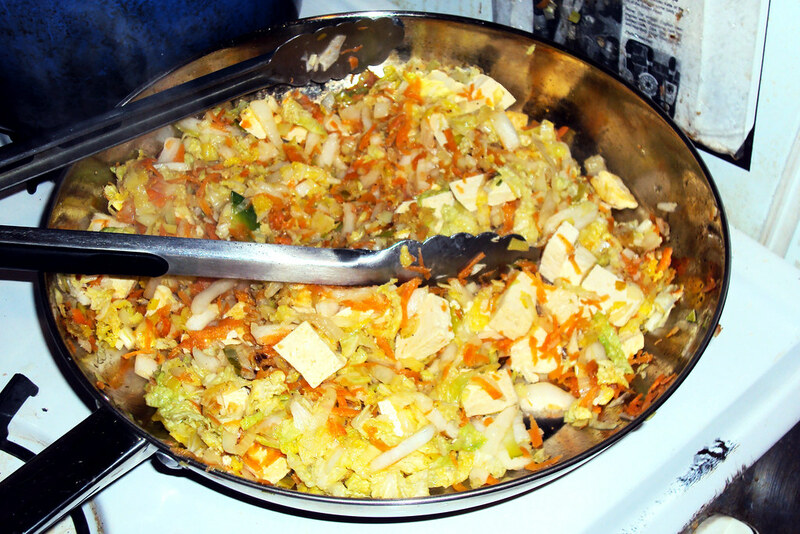 When vegetables are soft and any liquid has evaporated, add noodles, remaining tofu, and sauce to skillet. Toss to coat everything well and cook until noodles are warmed through. Serve, topped with chopped scallions. Kate — Granted, you stumbled with the rice and the “dessert” was a leap-of-faith but remember a coupla things: 1)Bittman with all his minimilism is, in a sense, working in a controlled environment….his own little lab. 2) Bittman did not have to contend with the swirl & sway of cooking with BF & Gary, your blogbuddy. So what if you “Bittman off more than you can chew”, you got back on that culinary horse rather quickly and from the viewing did just fine. I’m taken by the fact that you’re willing to improvise (more ginger, tofu instead of pork — regardless of the reason(s)) and provided some suggestion for additions and substitutions at the end. That’s part of the joy & jolt of cooking……working with what you have. I look forward to the “Foodie Call” installment. See ya at the Tiger.